On Wednesday, September 16, 2015 Amanda Scarpinati, of Athens, New York, posted a photo of herself on Facebook. 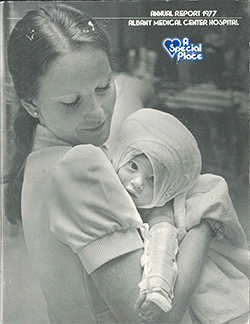 The photo, taken in 1977, was of her being held by a nurse at Albany Medical Center Hospital where Scarpinati, at only three months hold, was being treated for third degree burns. The next evening, in Cazenovia, New York, Susan Berger arrived home late where her husband told her there was a message on the machine from a reporter wanting to talk to her about a photo of a baby she cared for in Albany in 1977. Berger immediately thought of the annual report published by Albany Medical that year and was certain that was how the reporter came to find her. She decided to call the reporter the next day. Friday morning, after her husband reminded her about the phone message, Berger got out her copy of the annual report and headed to work. She contacted the reporter that morning and that's when Berger realized the full meaning of the story. The reporter, Torie Wells of CBS6, explained how Scarpinati had been trying for years to find the nurse holding her in the photo and had decided to try again, this time armed with social media. This decision led to a chain of events that ultimately resulted in the reporter’s phone call to the nurse in the photo - Susan Berger. Since the story broke, people – former colleagues from Albany Medical, old friends, and nurses Berger’s never met – have been reaching out to her, to reconnect or just say thank you on behalf of nurses everywhere. 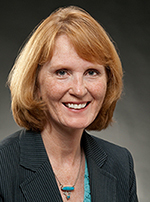 Berger, now executive vice president at Cazenovia College and a nurse practitioner, has fond memories of her time at Albany Medical, of her colleagues and of being a nurse. For Berger, holding onto the photo allowed her to hold onto that moment, that day. Berger started her nursing career at Albany Medical not long before, and the photo is a reminder of the essence of being a nurse – helping people. The reporter who first talked to Berger provided her with Scarpinati’s contact information and she and Berger have connected by phone. They traded stories about where their lives have taken them the last 38 years. Berger looks forward to meeting Scarpinati in person – there’s so much she wants to know about her, her life and her family. Berger, Scarpinati and Angela Leary, the nurse who revealed the identity of the nurse in the photo, have been communicating since the story came out. The three made plans to meet this week at Albany Medical Center Hospital, returning to the place where the story began 38 years ago.